This entry was posted in Climbing, Events, Previews & reviews, Women in adventure and tagged #climbing2me, #thisgirlcan, #wcs2015, adventure, climbing, outdoors on October 23, 2015 by Anna Paxton. I have attended the Sheffield Adventure Film Festival regularly for the past few years, so I was excited to have the opportunity to preview four of the films that will be shown in the Women in Adventure category at #ShAFF2015. This year there will be double the number of films featuring female athletes and/or made by female directors and producers. This is due to a conscious effort by the organisers of the event not just to select more films made by and featuring women, but to address the reasons that there are disproportionately fewer women in front of and behind the camera. There will be competitions specifically for Women in Mountain Adventure Films, Women in Adventure Photography, and the exciting development of a ShAFF Fringe Women in Adventure Forum. The Forum has the specific aims of celebrating achievement, inspiring and encouraging more women to get involved, and to establish a network for women in adventure/outdoors sport to keep the conversation going. The Showroom is a local independent cinema, it’s a perfect venue for ShAFF and really does help create the festival feel. It’s a great feeling to watch quality films with a crowd of people that ‘get it.’ In previous years there have been some fantastic moments, particularly the collective reaction to climbing films, often featuring familiar faces in places we know well and love. As well as celebrating the achievements of Sheffield’s outdoors community, adventure films are a source of inspiration, a way to open my eyes to sports or places that I haven’t seen before, and to possibilities and aspirations for myself. The following four films feature truly diverse women and their personal adventures. I absolutely loved watching them, and I’m looking forward to the rest of the ShAFF films. Finding Traction – As an aspiring ultra runner, I couldn’t resist the opportunity to preview this film in which female ultra runner Nikki Kimball takes on the record for running the Long Trail through the mountains of Vermont. At 273 miles, the Long Trail is the equivalent of running more than 10 marathons back to back, and includes twice the elevation of Everest. To run this trail non stop is an extreme physical and mental challenge, it’s fascinating and sometimes painful to watch the effects of fluctuations in nutrition, hydration, and fatigue. As a successful athlete with a career spanning many years, Nikki has an insight into the ways that women and men are treated differently in sport. She is running the Long Trail to publicise a charity, Girls on the Run, and wants to inspire young women to discover that being outdoors will make them happy. You don’t have to be a runner or a woman to enjoy this film, but if you happen to be both, don’t miss it! Megamoon – This film is made by Hannah Maia and features herself and her new husband as they cycle across the US Transcontinental Great Divide for their Megamoon. First this involves rafting the Colorado River through the Grand Canyon, then cycling from New Mexico, via desert heat, wind, and mud to Alberta, Canada. Hannah owns this film, she has shared a piece of her personal world and it is full of joy and the love of life. I particularly enjoyed the little moments captured by the camera, a wheel popping off the trailer unexpectedly, beard wiggling, and the face that happens when your tent nearly gets struck by lightning. I was so inspired by this film I was practically packing my bags to go and find my own Mega adventures before the end titles had finished. Patience – A short film by Jen Randall about alpine climber Emily Ward and her journey to recovery from serious illness against the odds. It demonstrates the need not just for physical strength but for mental strength and the persistence to endure. Often in life, it takes a negative event to force us to find strength through adversity – but I don’t think so in Emily’s case. I’m sure she was exceptionally strong before her illness, and will continue to be in spite of it. This is a woman who has made numerous first alpine ascents in Kyrgyzstan. This film challenged me to question whether I have the strength of character needed to achieve my goals. I hope so, and if so, what am I waiting for? Nobody’s River – In this film four girls from the USA kayak together along the longest free-flowing river in the world, first through Mongolia and then Russia. The film shares the highs and lows of the all-female expedition, the timing of this journey coinciding with an unforeseen tragic period in their lives. They encounter the beauty, naivety and spontaneous magic of Mongolia, tempered by the sometimes brutal reality reflected in the Russian experience. Feeling themselves bonding as a tribe, they are forced to take difficult decisions, having to make the right calls both as a group and individually. This is a film about friendship as much as adventure, the girls survive the physical and emotional challenges of the journey together using their unique blend of strength, capability… and just the right amount of intuition. This entry was posted in Films Books & Art, Previews & reviews, Women in adventure and tagged #ShAFF2015, #thisgirlcan, adventure, climbing, film, Films Books & Art, Trail running, travel, women, Women in adventure on January 29, 2015 by Anna Paxton. 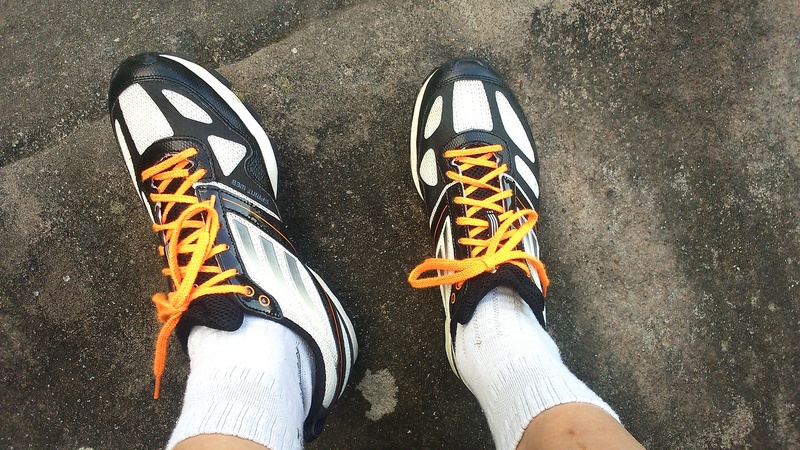 I had been searching for a while for multipurpose trainers that could be used as approach shoes and for trail running. I’m not sure there is a shoe designed for both, but I was finally recommended the Adidas Adizero XT4 by experts at my local running shop www.frontrunnersheffield.co.uk . The first thing I notice when trying on shoes is the style – it’s not the most important factor and functionality always takes precedence for the final choice, but I still want to look and feel good in my gear! Women’s shoes generally aren’t made in my size, so in the past I have had to buy shoes in chunky masculine styles. The XT4’s orange white and black colours are gender-neutral, and I love orange so I was excited to wear them. They look enough like ‘normal’ trainers that I was happy to wear them with jeans in the day – this is important to me when I’m travelling and I need to take the smallest amount of luggage. Adidas shoes generally have a slim fit, my AdiZeros are size 8.5 when I would usually wear size 8. I have long skinny feet, and have had problems in the past with shoes that are too wide, meaning that my feet slipped around inside them. The AdiZeros felt secure with enough space to be comfortable, but they didn’t come loose or rotate around my feet, even on rough terrain. The fit is perfect for me, but might not suit people with broader feet. I really tested the AdiZero XT4’s performance on a month long trip to California – with only this one pair of shoes! Encountering a heat wave I covered around 10-15 miles a day hiking and trail running. They were comfortable from the start and didn’t need wearing in, I never had any blisters despite long hot days, and the mesh over the toes means they’re breathable and felt cool. They were perfect for hiking and running on the granite and sand trails, although the mesh uppers meant that on dusty sections the toes quickly filled with sand. When the heat wave passed I managed to get on the rock and climb, and for cragging and longer days the XT4s were exactly what I wanted in my approach shoe. The Continental rubber soles are super sticky, and I felt confident even on smooth granite slabs and domes. They aren’t stiff enough to be perfect approach shoes, but they don’t claim to be. I prefer a lighter and tighter fitting shoe so that I can feel the rock under my feet, and I found them grippy enough to scramble where necessary. One of my favourite features is that at 280g the shoes are really light, which is a bonus when travelling with luggage restrictions. After a long day I never felt that they were weighing me down, and they are perfect for attaching to a harness. I was concerned that the gear loops and stitching appear flimsy and may pull out over time, although it hasn’t been a problem so far. Back in the UK, and the XT4s became my trail racing shoes.There is a section of sharp spikes in the centre of the sole which I really noticed in wet conditions when I knew that they were biting into mud and grass. I used them for routes over grass, woodland, and short bursts on the road – you can run on tarmac in them if you want to, although the rubber will wear faster and there isn’t much cushioning so it feels pretty harsh. Now the clocks have gone back, I have been using them as fell/trail running shoes in the dark, rain and fog around the Peak District. In previous trail shoes I have slipped while running in the rain, but I have learned to trust the Adidas XT4s, and feel confident in them, even on wet rock. After running through streams and bogs my feet felt warm again quickly and there was no disgusting squelchy sensation. The light and airy construction of the shoe means that they dry quickly. My main gripe is that the laces come undone frequently, and perhaps textured laces or a different lacing system would be better. The shoes have taken a hammering over the past few months but in spite of the light construction and several layers of dirt, there’s not too much wear yet. My favourite features are how light they are, the sticky rubber soles, and the look of the shoe. The slim fit won’t suit everyone’s feet, and you would want to buy more specialist shoes if you have a specific purpose, particularly for fell running. They are in the mid to upper price range (RRP is £80), but for me although they are sold as trail shoes, they have replaced separate pairs of approach shoes and trail shoes. 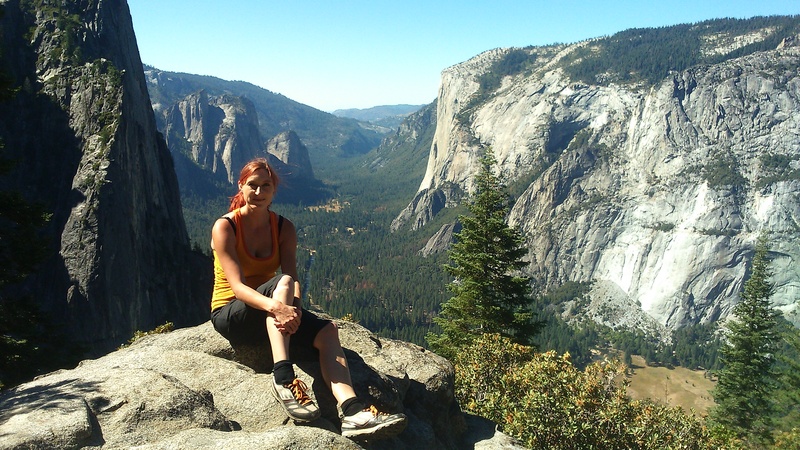 This entry was posted in Gear, Previews & reviews, Trail running and tagged adidas, approach shoes, gear review, Hiking, running, scrambling, shoes, Trail running, trail shoes, trainers, yosemite on November 6, 2014 by Anna Paxton.